My husband recently purchased a clock and I would love to know more about it! 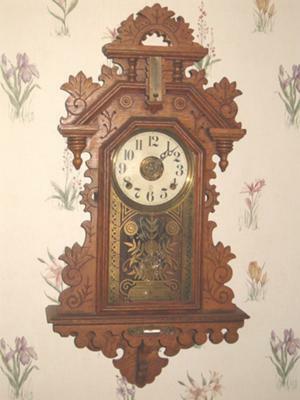 It is a E. Ingraham Co. mantle clock in woodgrain. There is a full label on the inside of the back door which indicates the model is Hermes Duplex 7 inch. NOne of the websites have this model and it is an eight day. It appears to be circa 1930-ish? If anyone has any information, please let me know! Thanks! This clock was in my grandparents house on their mantle since the late 40's, maybe earlier. I don't know much about it other than it is key wound and chimes on the hour and single chime on the half hour. The wood case is a rich dark brown either mahogany, walnut, or some other dense fine grain wood. The dial is paper I believe or heavy card stock. I have found that the chimes are wound on the left and works on the right facing clock. There is a slow/fast adjustment at the top of the face which is also key set. The pendulum is a very heavy bronze colored disk that shows through a window in the front glass. The window is hand painted with a gold design and blue and red flowers. I don't know when the clock was purchased by my grandparents. Can someone tell me how to date this beautiful time piece or tell me any information about it. Any info would be appreciated as this clock now resides on my mantle and keeps perfect time. I recently found this clock at a flea market and instantly was in love with it. I've never been a clock person, but for some reason this one just grabbed me. It runs well, has a paper face with metal brass-color overlay. The case is wood (although I don't know what kind) and I can't find a label on it. The only mark I can see is on the face where is says F.S. The back is painted or lacquered black so I'm wondering if there may be markings under the black. The hole in the back has a thin metal cover to it stamped with '1189.' The clock 'dings' on the hour and 'gongs' the hour on the half hour, which I'm sure is backwards of the way it should be, but certainly doesn't bother me. The pendulum is accessible through a hole in the base of the clock. I would love to know anything and everything about the clock or its possible age! 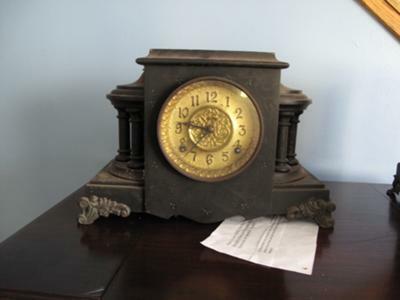 We have a wall clock from the E. Ingraham Co.
We would really like to find out the name and age if at all possible. We have scoured the internet and can't find anything similar to it. It belonged to my in-laws family. If we can find some kind of pricing it will be going up for sale. As we have decided to go RVing fulltime and wish it were possible to travel, but it would not be fair to such a beautiful piece. We also have another clock that I will post on another post. Thank you for anyones time. 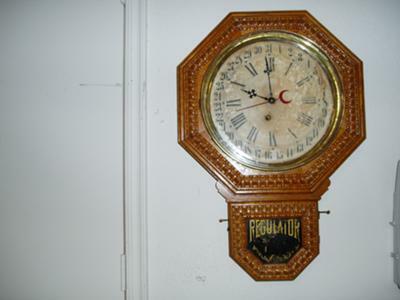 This is a Regulator wall clock made by E.Ingrahamn Co. Bristol, CN. It has Roman numerals and a hand that shows the day of the month. It ha a pat. of Apr. 13, 97, Sept. 14, 97, Nov.23, 97. It has a 12" face. The box is 17" wide and 24" long. I know on the back it says The E. Ingraham company. I found this clock in my dads garage and I'm trying to clean it up and get it working again for him. 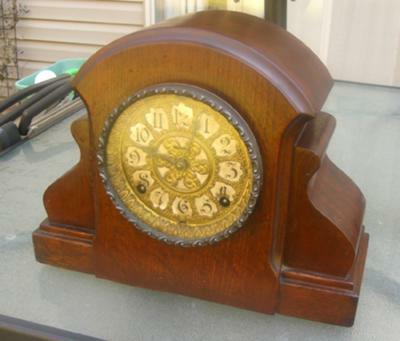 It's missing the inside components and the face of the clock, but the wood is in great shape. Im hoping you guys can help me out with where I can get parts for it. What can you tell me about this clock? It is 17 inches wide, 12 inches tall and 5.5 inches deep. 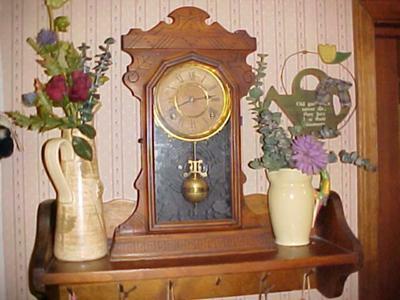 This clock is made by Ingraham Co. and it has a pendulum inside. It chimes and works just fine. I would like to know what is the model and/or year it was made and a rough idea on the value of it. I found a clock this weekend. The paper label on the back reads Ingraham Raven. I haven't seen a clock like this before. Is it rare? Does it have value? My grandparents bought this in April 1970 at Adam's Swap Shop in Wenatchee, WA. They kept this in the mantel for years and I always loved it. Upon their passing, I received the clock and it's on my mantel. 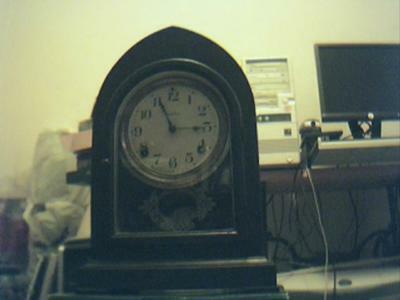 However, I was trying to ID the clock and it doesn't match all the pictures I've found online. Please help me figure out what exactly this clock is? The sticker on the back says "Keuka was manufactured by the E. Ingraham Co., Bristol, Conn, USA". Then it gives the directions on how to wind it. Also, there's a "111" on the sticker as well. I looked this up online and I can't find a match to this clock. Please help! Thanks! The antique dealer said the clock was 1860, but I have my reservations about that. The clock says E. Ingraham Co. Bristol Conn.U.S.A. Also, on the face it's called a Sentinel. It's a 12 inch steeple clock. This is a simple hand, spoon carved case,wood may be maple. 1886 was the date I was given from grandparents. It is an 8-day with hourly chime. I am curious about the case. Where was this made and by whom. Glass is not original. This clock is an Ingraham. It works and it's a mantle clock. It has a pendulum with a picture of a woman on it and a glass front with an eagle, with two American flags on either side of it. A wreath under that with crossed swords on the left side and a cannon under the swords and a bugle on the right. Reply from Bill - Hi Robert, If you can post further information it would help to identify your clock. 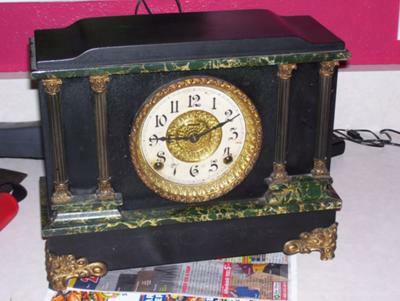 The pictures you describe could be on any number of clocks since the clock companies usually re-used them over and over - especially when it became popular. 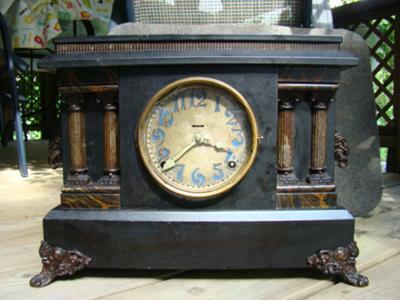 What is needed is the type of mantel clock, such as banjo, OG, Cottage, etc. If you don't know a picture or description of it's size, shape, materials it is made of, any markings or labels, etc. E. Ingraham Clock Company made millions of clocks in hundreds of styles and models as did all the other American Clock companies. Our visitors and I would like to help id your clock, but the more details you give, the better chance we have. Thanks for posting. If you can provide more info, you can click on "Post a comment" below. If you have a picture of your clock, post it in a new submission with your name, and Ingraham, in the titles and I will move your picture here.